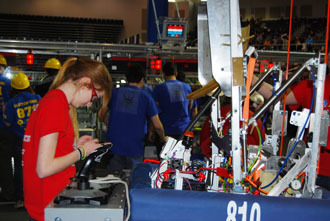 School-Business Partnerships of Long Island, Inc. (SBPLI) announced its award winners at the 15th annual SBPLI Long Island Regional FIRST (For Inspiration and Recognition of Science and Technology) Robotics Competition at Hofstra University’s David S. Mack Sports and Exhibition Complex (Arena) in Hempstead, New York. The event was held March 27-29. More than 2,000 students from 50 high schools from Long Island, New York City, New Jersey, and Brazil participated in the competition. Teams received honors and recognition that rewarded design excellence, competitive play, sportsmanship and high-impact partnerships among schools, businesses and communities. With the hope of winning one of several coveted awards, high school students worked with professional mentors to design, program and build a robot over a six-week timeframe using a "kit of parts," which consists of some materials that can be used in whichever way teams would like and a standard set of rules that helps teams manage quantity, type and the price of their materials. The students gathered to compete with their robots in this year’s game, “Aerial AssistSM,” in which two Alliances of three teams each attempted to shoot as many balls as possible into goals during a two-and-a-half-minute match. Additional points were earned by robots working together to score goals, and by throwing and catching balls over a truss suspended just over five feet above the floor as they moved the ball down the field. ** These teams are eligible to participate in the FRC Championship that will take place April 24-27 at the Edward Jones Dome in St. Louis, MO. SBPLI named Troy Douglas, a longtime volunteer at the Long Island FRC, as its Volunteer of the Year. Winners of the Dean’s List Finalist Award were Justin Green of the Half Hollow Hills High School West Robotics Team #3624 and Thomas Ciravolo of the Walt Whitman High School Robotics Team #2161. This year’s sponsors included FESTO Corporation, BAE Systems, Northrop Grumman, Stony Brook University, Hofstra University, Farmingdale State College, The Estée Lauder Companies, Schneck Trebel Corporation, and School Construction Consultants, Inc. among others. SBPLI is currently seeking local businesses for sponsorship opportunities for the 2015 Long Island Regional. For more information, please visit www.sbpli.org. 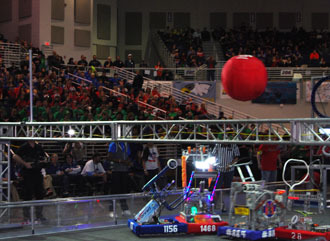 A robot from Pierson High School Team #28, hurls the ball over the truss past the robots from Marista Pio XII High School Team #1156, Hicksville High School Team #1468, and Malverne High School Team #884 during a match at the School-Business Partnerships of Long Island, Inc.’s Long Island Regional FIRST Robotics Competition at Hofstra University on March 29.